At Kattner Orthodontics, we strive to provide our patients with the highest quality treatments possible. We know that every patient is different, and each deserves orthodontic treatment options that are specific to their unique smile. That’s why Dr. Kattner offers various types of braces for those in and around Beach Park, Zion, and Waukegan. Before choosing an orthodontic treatment, it’s important to know the differences between your options. Braces are a type of fixed appliance, meaning that they cannot be removed from your teeth without your orthodontist. They are bound to your teeth with metal bands or cement and normally aren’t removed until treatment is complete. Removable appliances, such as Invisalign, are worn about 22 hours out of the day and may be taken off by the patient as needed. While removable appliances are effective in treating mild to moderate cases, fix appliances are generally needed for more serious orthodontic problems. 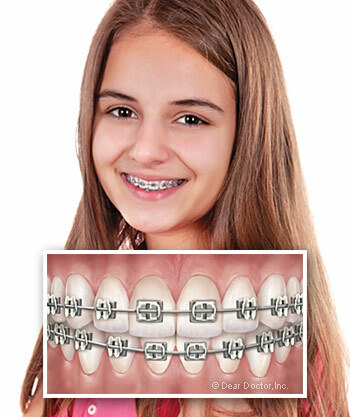 Metal braces are the most traditional and most common form of braces. Made from high-grade stainless steel, these braces are one of the most durable, reliable and affordable treatment options for patients who want to change their smile. Metal braces are fixed in place with metal brackets cemented to the front of the teeth. Modern metal braces use smaller and lighter brackets than those used in the past, making them more comfortable for the patient and less visible to others. Ceramic braces have gained popularity recently as a less noticeable alternative to traditional metal braces. 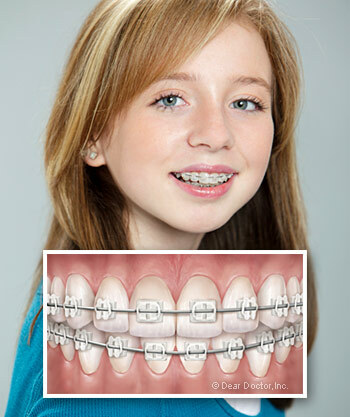 These braces are commonly preferred by adolescents and adults because of their clear appearance. They use the same components as metal braces, except the brackets are made of a translucent ceramic material that blends in with the natural color of your teeth. While ceramic braces can be less durable and more expensive than metal braces, their discrete nature is very valuable to some of our patients. The best way to determine which type of braces is right for you is to speak with your local Waukegan orthodontist at Kattner Orthodontics. Dr. Kattner will thoroughly exam your teeth and bite in the consultation to determine the best treatment options for you. To schedule an appointment, please contact us by calling (847) 244-7900 or via email at info@kattnerorthodontics.com. You may also request an appointment online at any time. We hope to hear from you soon to help you on your way to a lifelong healthy, beautiful smile!